We first met at Teachers College Reading and Writing Project. Though Katy was new to the Project and Shana was a veteran, we immediately connected, first around teaching, and then around books. One work trip to Van Buren, Arkansas cemented the bond. Over the Hampton Inn’s complimentary breakfast, we talked nonstop about kids and teaching and amazing books. So colleagues became friends and friends became writing partners. This blog is the merging of our many identities—readers and writers, teachers and talkers. We started this blog because. Because we wanted to think together about the work we do every day. Because we wanted to make ourselves write. Because we wanted to unleash our early-morning phone calls on the world. Because we wanted a forum to think deeply and creatively about teaching in general and teaching talk specifically. Because Lisa Johnson said creating time for talk is not the same as teaching talk. Because we wanted to join in a community of talkers and teachers, so we can all do both even better. And most importantly, because kids are magical and at the end of a tough day it’s those darndest things that kids say that make us want to wake up and do it all over again. As a senior staff developer at the Teachers College Reading and Writing Project, Shana Frazin (on the right) works closely with administrators, coaches, teachers, and kids across New York City, the country and the world. She has led leadership groups on strong readers and higher level comprehension as well as taught institutes on the teaching of reading, writing and content area. Prior to joining the Project, Shana taught 3rd, 4th and 5th grades in Pasadena and Los Angeles Unified School districts, and was a faculty member at Pacific Oaks College. Her “Once Upon a Time” began in Rockford, IL and she is currently authoring her very own “Happily Ever After” in New York City with her dog, Floyd. She tweets at @sfrazintcrwp. 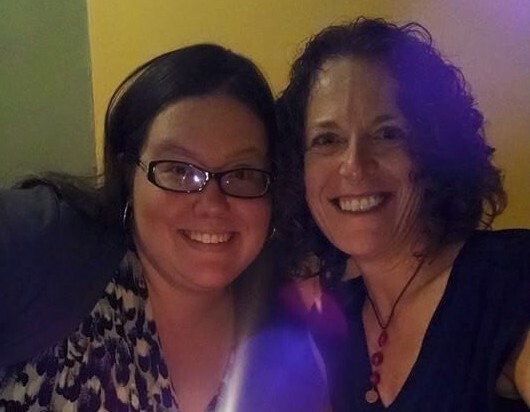 As a staff developer at the Teachers College Reading and Writing Project, Katy Wischow (on the left) supports elementary and middle schools not only in New York City but also across the nation and the world. She has been an adjunct instructor at Columbia University’s Teachers College, teaching graduate courses in literacy education. Before joining the Project, Katy earned her MA in the Literacy Specialist Program at Teachers College and taught for many years in Newark, NJ. Katy has always been passionate about curriculum development and about helping teachers bring their own reading and writing lives into their teaching. She tweets at @kw625. It’s amazing what can happen over a Hampton Inn breakfast, eh? Congrats on this new blog. So excited to learn from the two of you. Thanks, Stacey. Right back at ya! I can’t wait to learn from you both. Thanks for letting us take this journey with you. i couldn’t be more excited about a blog from two of the smartest teachers of and thinkers about literacy i’ve seen! You are too kind, Kate. Thanks! Hi, Shana! This is a topic I have been thinking and talking (!) about for a long time now. You are so smart to start a blog on this deeply important part of teaching, learning, and life! Kathy Doyle! How wonderful to re-connect. We need to plan an outing for catching up on life and literature. xo! Shana when I saw your name connected to a blog I just had to check it out. I still talk about the training we got from you with others here in New Haven (Union City, CA). I’m excited to read and learn from both you and Katy. Wow! Blast from the past. New Haven feels like a long time ago. Hope everyone is well. Hi Shana-loved the first blog, can’t wait to read more! Thanks, Vera-Lisa. We are hoping to post once or twice a week. Keep reading and commenting! So super excited that you both started a blog!! I will stop by frequently. Now, it’s like you never left VB. Best writing wishes! What a delightful blog! Beautiful writing about interesting topics…ahhh, a breath of fresh air.